The purpose of this article is to provide an overview regarding the accounting for and presentation of contract assets and contract liabilities. 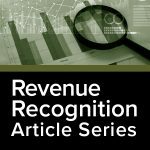 This article, and the related articles, provides a brief overview of the FASB Accounting Standards Codification – Topic 606, Revenue from Contracts with Customers (ASC 606) and omits requirements specific to public entities and many optional disclosures for non-public entities. ASC 606 and related guidance should be referred to for additional information and detail. A contract with a customer creates legal rights and obligations. The rights and obligations under the contract may give rise to contract assets and contract liabilities. Commonly referred to as unbilled receivables or progress payments to be billed. A contract asset is an entity’s right to consideration in exchange for goods or services that the entity has transferred to a customer when that right is conditioned on something other than the passage of time (for example, the entity’s future performance). Receivables should be recorded separately from contract assets since only the passage of time is required before consideration is due. When goods or services have been transferred to a customer, but customer payment is contingent based on a future event, this amount is generally referred to as an unbilled receivable. Commonly referred to as deferred revenue or unearned revenue. A contract liability is an entity’s obligation to transfer goods or services to a customer for which the entity has received consideration from the customer (or the payment is due, see Example 2) but the transfer has not yet been completed. Assume the same facts in the previous example and additionally, the contract becomes non-cancellable on January 15, 2019. The following journal entries are made to account for the contract. On January 1, 2019, an entity enters into a contract to transfer Product 1 and perform Service 1 to a customer for a total consideration of $750. The contract requires Product 1 to be delivered first, and that payment will not be made until Service 1 is performed. The entity has concluded that the delivery of Product 1 and the performance of Service 1 are separate performance obligations and has allocated $500 of the contract revenue to Product 1 and $250 to Service 1 based on analysis and historical data. The following journal entries are made to account for the contract. On January 1, 2019, an entity enters into a contract with a customer to transfer equipment and perform maintenance service for three years to a Customer. The contract requires the equipment to be delivered first for consideration of $6,000. Consideration for maintenance services amounts to $2,000 per year. Total contract price amounts to $12,000 and is invoiced annually on January 31, in the amount of $4,000 per year. The resulting allocation of the transaction price to each performance obligation on a stand-alone selling price basis results in 20 percent of the revenue ($2,400) allocated to the equipment and 80 percent of the revenue ($9,600) allocated to the maintenance. On January 1, 2019, the customer receives the equipment and pays the entity $4,000. The equipment and the maintenance services are distinct performance obligations, and the maintenance part of the contract was deemed to be a stand-ready obligation. The entity would allocate cash to the satisfied performance obligations (the equipment and the satisfied portion of the maintenance) while recording the remaining consideration due associated with the satisfied performance obligation as an unbilled receivable. Essentially not presenting a contract liability for maintenance paid for by the customer before performance. Contract assets and contract liabilities should be presented as current and noncurrent in a classified balance sheet, and determined at the contract level. Contract assets and liabilities for each performance obligation within a single contract should be reported on a net basis. Liabilities recorded for product returns and volume rebates should not be netted with contract liabilities or assets, as they represent a separate expectation (i.e., expectation of cash payment as opposed to performance expectation). Similarly, capitalized costs to obtain a contract should not be combined with contract assets. Capitalized incremental costs to obtain a contract should be presented as a single asset and classified as long-term unless the original amortization period is one year or less. Generally, the amortization of costs of obtaining a contract that are capitalized should be amortized and reported as expense within the selling, general and administrative section of the income statement. ASC 340-40 provides that incremental costs to obtain a contract that are incurred as a result of obtaining a contract should be capitalized and amortized over the life of the contract (such costs may include sales commissions related to multiyear service contracts), if the entity expects to recover those costs. Costs to obtain a contract that are incurred regardless of whether a contract is obtained (such as travel or contract drafting legal expenses) should be expensed as incurred.